"I need to download a YouTube video and INCLUDE a subtitle together with the video. How can I do that? Which software to use?" For a variety of reasons, we always need to download YouTube videos, but unfortunately, the subtitle cannot be downloaded together. How could this happen? This is because the subtitle is written on the screen, not embedded in the video. That is to say, YouTube subtitles and videos are independent, so generally, you can't download YouTube videos with subtitles. Seeing that subtitle is tremendously important for hard-of-hearing people and non-native speakers, we will illustrate how to download YouTube subtitles and insert downloaded subtitles to downloaded videos. WinX HD Video Converter Deluxe – The built-in free online video downloader can download YouTube videos with embedded subtitles, and videos/movies/songs from other 300+ video-sharing sites. Meanwhile, it is available to add (downloaded YouTube) subtitles to videos easily. How to Free Download YouTube Subtitles? To download subtitles from YouTube, you are supposed to make use of a YouTube subtitle downloader, such as KeepSubs, DownSub and Google2SRT. Here, let's take DownSub as an example. DownSub is a free web application available to download and save subtitles directly from YouTube and several other sites. It is very easy to use. Step 1. Navigate to DownSub site, then copy and paste target YouTube video URL to the text field of DownSub. Step 2. Hit the blue Download button to load available subtitle tracks. Step 3. Select your desired subtitle track to download, and then it will begin downloading YouTube SRT subtitle to your local folder. After finishing YouTube subtitle download, how to merge downloaded YouTube video with subtitle to better understand what the video talks about? The best and easiest way is introduced below. How to Insert Downloaded YouTube Subtitle to the Video? Undoubtedly, we also need a program. And WinX HD Video Converter Deluxe is highly recommended. This tool can not only free download YouTube videos in SD, 1080P HD, 4K, 8K to MP4, FLV, WebM and 3GP, but also capable of inserting external SRT subtitle to the video. No technical skills required. Just do as follows. First of all, download WinX HD Video Converter Deluxe and install it on your PC. 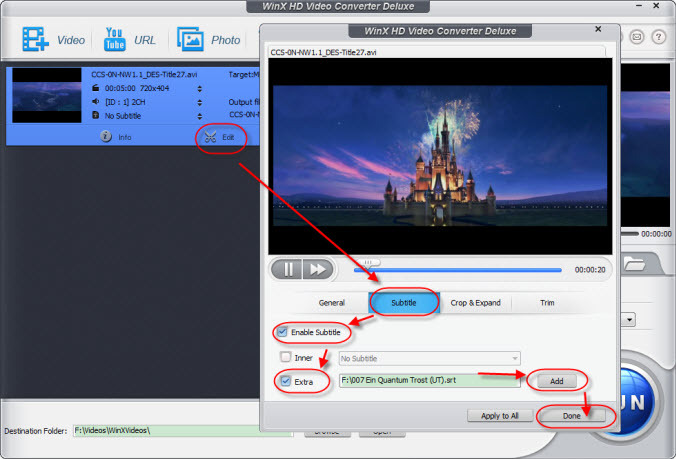 Mac users turn to WinX HD Video Converter for Mac. Step 1. Run this software and click +Video button to load the video you want to insert the YouTube subtitle to. Note: After importing video successfully, this subtitle inserting tool will present an Output Profile window to prompt you to choose an output format. You can choose one same to the original, or select a different one. Then, hit Ok. Step 2. Click Edit button, move to Subtitle tab, tick Enable Subtitle -> Extra, and press Add button to open the SRT subtitle downloaded from YouTube before. After that, just hit Done. Step 3. If you have completed all settings, you can press lower right RUN button to begin inserting downloaded YouTube subtitle to the video you downloaded. - Convert videos to popular devices, such as iPhone 6S, iPad Pro, Samsung Galaxy S6 Edge+, Sony Xperia Z4, WP8, Xbox. - Make vivid photo slideshow for uploading online, such as YouTube. How to Rip DVD with Forced Subtitle Only? [Solved] Is It Legal or Illegal to Download YouTube Videos?